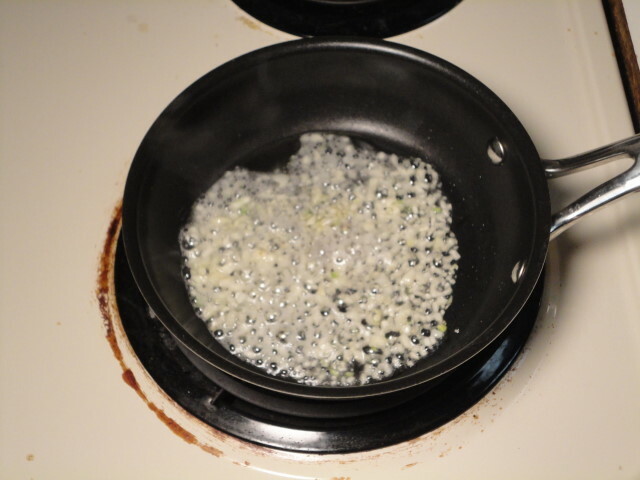 First, you should mince some garlic and let it sit with the oil in a bowl. This is to infuse the oil with garlic goodness. I did this before I made the dough, which was about an hour ahead of time. 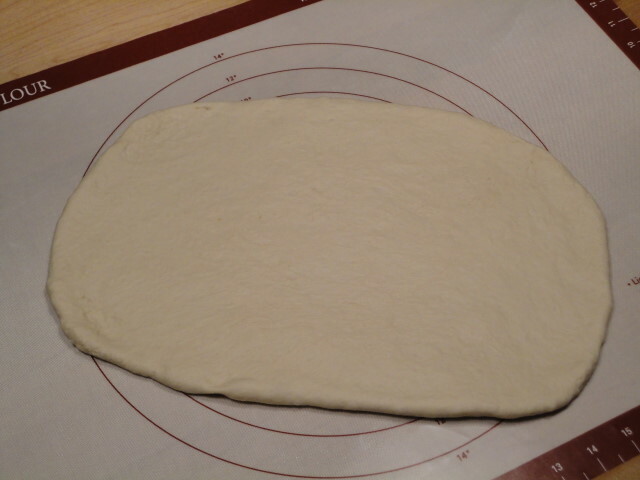 When your dough is ready (after thawing it or letting it rise), cut it into pieces. The size of the pieces depends on how big you want your knots to be. 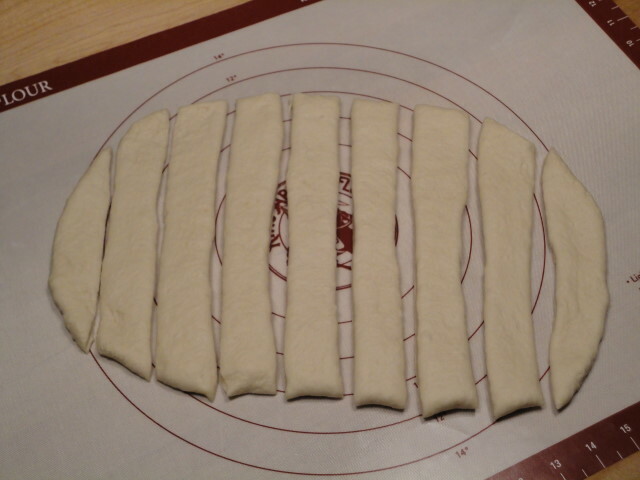 I wanted big ones, so I cut my dough into nine pieces. 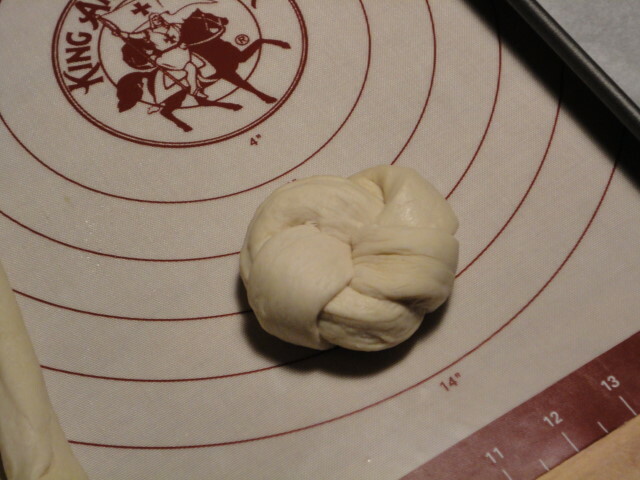 The easiest way to do this is to roll out the dough with a rolling-pin or a large bottle. You can, of course, just use your hands. Form it into something of a rectangle. Next, cut it into strips, the short way. 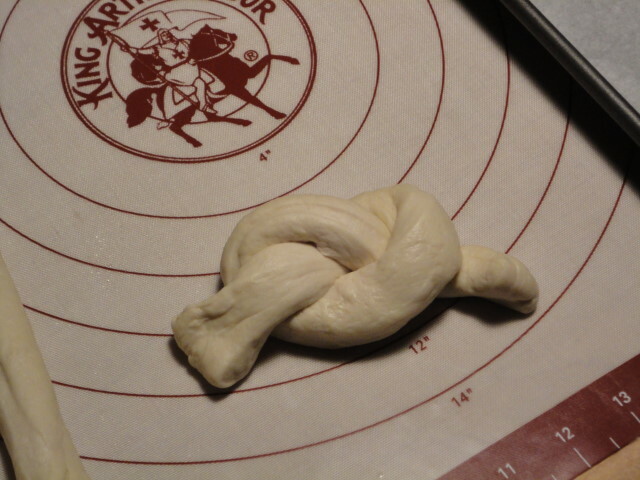 Now tuck the two free ends into the opposite side of the knot, in the center. 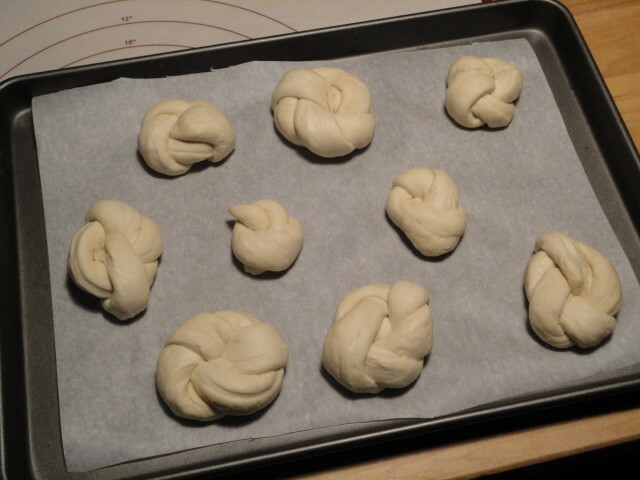 It doesn’t have to be perfect, they’ll be delicious however they’re tied. 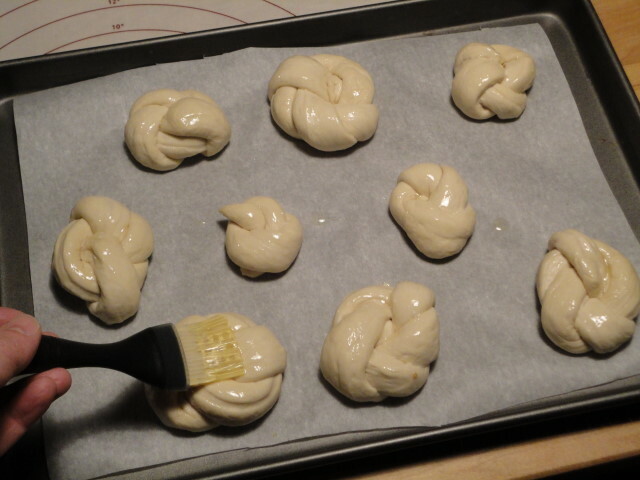 Place your knot on a baking sheet and repeat for each dough piece. It’s probably a good idea to make them roughly the same size, but you can see that it doesn’t really matter! 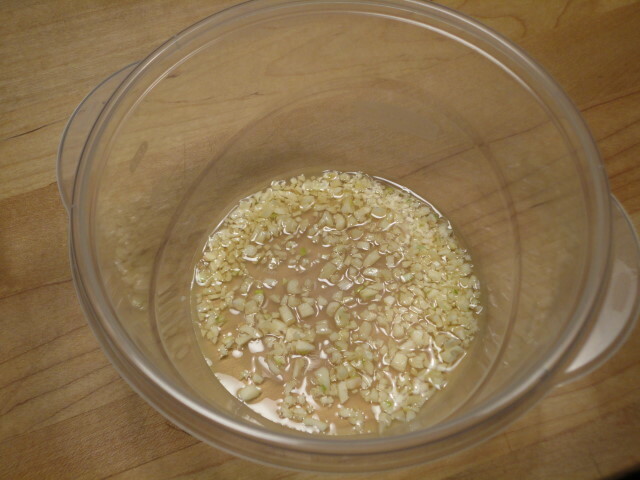 Next, brush some of the garlic-infused oil onto them. 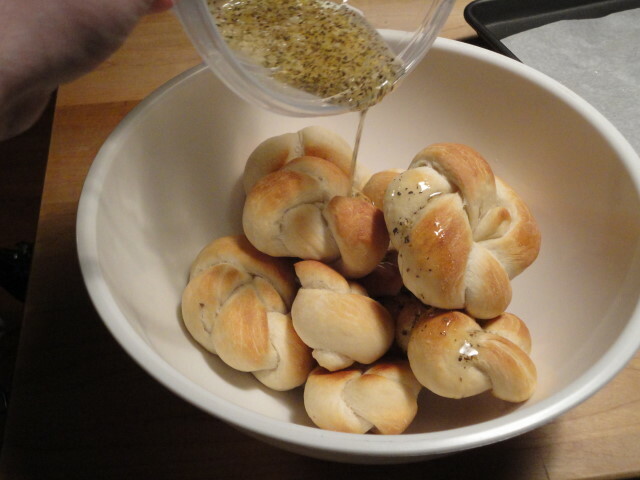 This isn’t a usual step in garlic knot recipes, but I wanted to give them a little extra flavor. Let these guys rise, covered with a towel, for about 20 minutes. Meanwhile, preheat your oven to 375° F.
Take off the towel and place them into the oven. Let them bake for about 20 minutes. It may take more or less time; you want them to get nice and golden brown. While they are baking, heat up a frying pan over medium heat. Dump in your garlic and oil and lightly saute the garlic. This will definitely finish transferring the flavors from the garlic to the oil. Add the basil and oregano and remove from the heat. 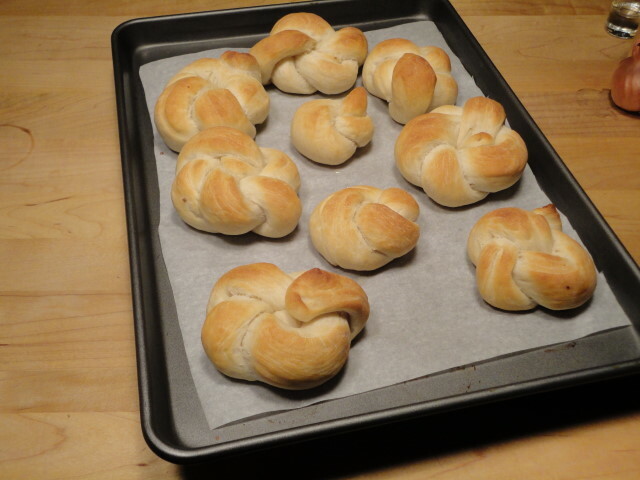 When they’re nice and golden brown, remove your knots from the oven. While they are still hot, dump them into a bowl. Then pour the garlic/basil/oregano/oil over them and toss them to coat. Sprinkle liberally with grated Parmesan cheese. You may want to sprinkle some salt over them as well. I didn’t use any salt, since the Parmesan is pretty salty already. 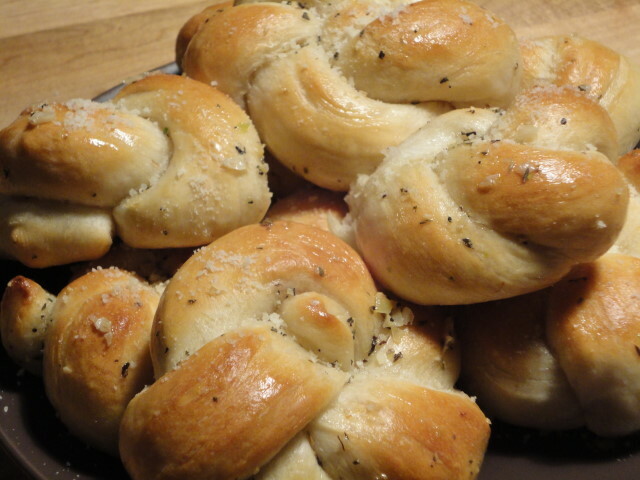 Place them onto a plate, or back on the baking sheet to cool.